The "to scale" CK1004 Plug is made to work with the CK1003 Outlet and may be attached to the bulb wires from any lighting fixture. To make an electrical connection, stripped lamp wires are simply inserted into small holes in the side of the plug and the supplied pins pushed in from the front. Since the plug is not permanently attached to the wires it may be reused time and time again, a real plus! 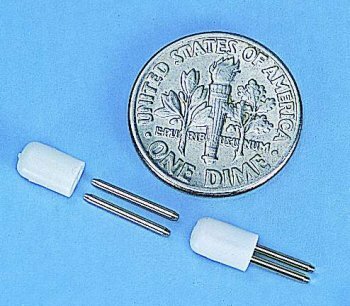 The plug is made of hard, white plastic and extends less than 1/4" when plugged in. Assembly instructions included. 600 ma current rating.